Discussion in 'UFOs, Aliens, Monsters, and the Paranormal' started by Mick West, Mar 13, 2012. The suggestion being that there's somehow a giant spherical object hovering near the sun. 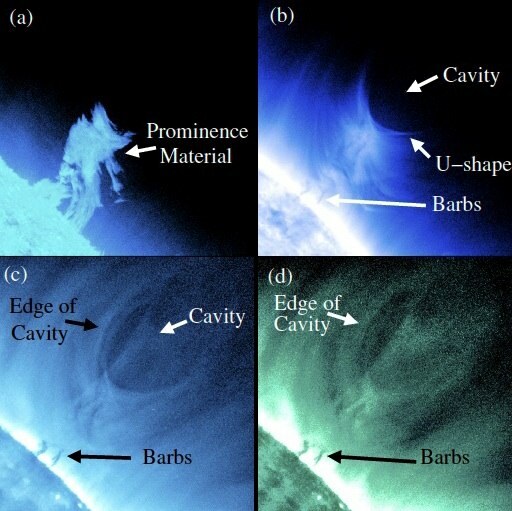 What this is though is just something that's unfamiliar to most people, but something that solar scientists have been aware of for some time, a transitory cavity in the solar plasma field, known as a coronal prominence cavity, or polar crown cavity. Often associated with Coronal Mass Ejections (CMEs). This does appear to be a quite interesting one, with attached vortex. But that's all it is. Not a giant space ship sucking fuel from the sun. 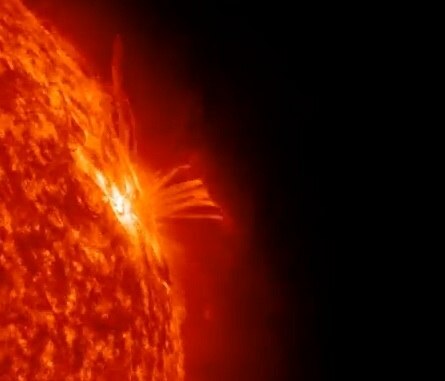 You see a lot of these types of "odd-thing-near-sun" things on YouTube, based off video feed from the Solar Dynamics Observatory. That's basically because the SDO is new (just two years old), and people are not used to the amazing displays the sun puts on. Some of which will be new to science as this the the best view we've ever had of the sun. 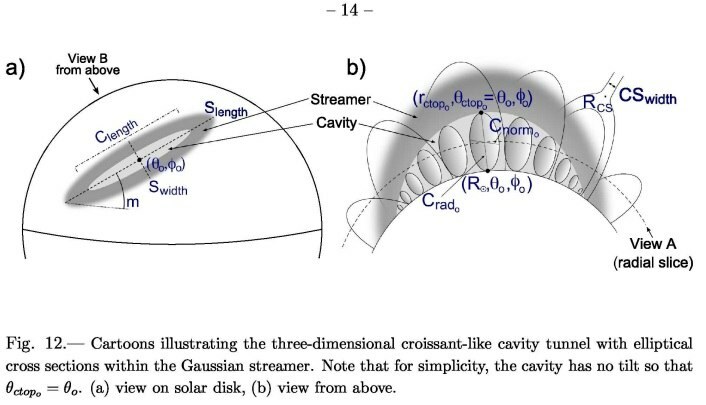 We propose to define a polar crown cavity as a density depletion sitting above denser polar crown filament plasma drained down the cavity by gravity. As part of the polar crown filament, plasma at different temperatures (ranging from 50 000 K to 0.6 MK) is observed at the same location on the cavity dips and sustained by a competition between the gravity and the curvature of magnetic field lines. more visible because of projection against the background sky. 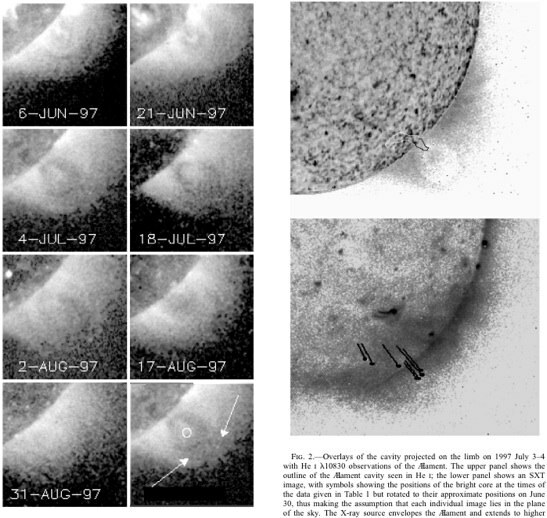 ejections (CMEs) of the “streamer blowout” type. 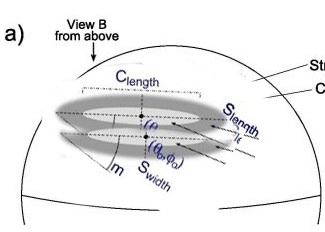 Seen in the accompanying movie, forward modeling was used to predict morphology of a coronal prominence cavity. The animation shows EUV observations of a cavity from NASA’s STEREO spacecraft on the top/left, as well as the forward-modeled predicted EUV for the coronal cavity on the bottom/right. As time goes by in the movie, it’s possible to see the 3-dimensional, tunnel-like cavity rotate past. 1) Nothing like the perfectly spherical object seen on 11 March 2012 can be seen where you quote "cavities" at http://www.issibern.ch/teams/coronalprom/issipropsmall.pdf or here http://mithra.physics.montana.edu/mckenzie/Pubs/hahm98.pdf or here https://nar.ucar.edu/2010/lar/page/...-signals-gaining-new-perspective-solar-corona - all the things seen there are visibly different and UNRELATED to the "black spherical object" March 11 phenomenon. 2) Why the visibly spherical object or "black spot" ("cavity", "black hole" or whatever it is), does not EXPAND when moving away from the Sun? Any explanation except it is a solid object? 3) Why the movement of the spherical object or "black spot" on March 11 ("cavity", "black hole" or whatever it is) is sudden, like the object deliberately being steered away from the Sun? 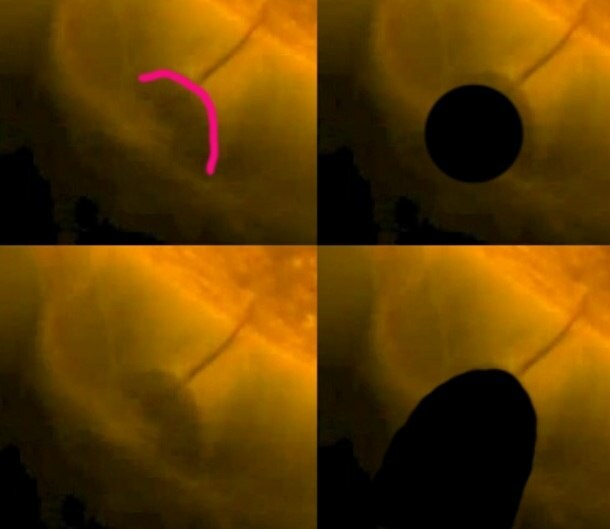 4) How do you explain the visible trails of lower temperature solar surface seen on the NASA photos (from right to left south of the equator spiraling south and ending with the "plasma filament" that are NOT parallel to the Sun's equator (like, trails of the "sucking" by the black object that are cooling the solar surface)? 5) Any clue why this phenomenon is happening only on the "southern hemisphere" of the Sun? Why not seen on the northern? 1. It's not spherical. You can only see the arc of the cavity that's closest to the sun. Even from that it's not particularly indicative of a sphere. Does this dark area look like a sphere? All you can see is a bit of an arc. Nowhere in the video do you see a sphere, or even a full oval. 2. it does expand. See the video by thesuntoday. As it moves away, the curvature of the visible region of the cavity increases, indicating it is expanding. But again you can't see the whole thing. 3) It's basically a CME. 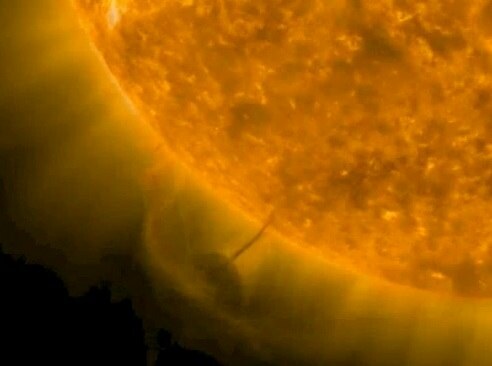 The prominence is what is being ejected from the sun. I don't know the precise physics. 4) They look pretty much like random regions on the surface of the sun to me. You get some incredibly large scale irregular features on the sun. 5) I suspect it happens on the north too, just this is a rather small sample size. And here's one in the north. Hard to see in stills though. I expect Scott Stevens will chime in on this, unless Michael J. Murphy is able to keep him quiet. Here's an image of what the filament/prominence looked like the day before, proving that this common solar feature was identified long before anyone made claims of a space ship refueling. The only way this could be even more bizarre is that if Stereo B also sees the defined sphere... ahh here we go. Remember this is a side angle point of view seeing the same event. At some point you have to admit that this is extremely interesting. For reference, here's the source of the STEREO images. 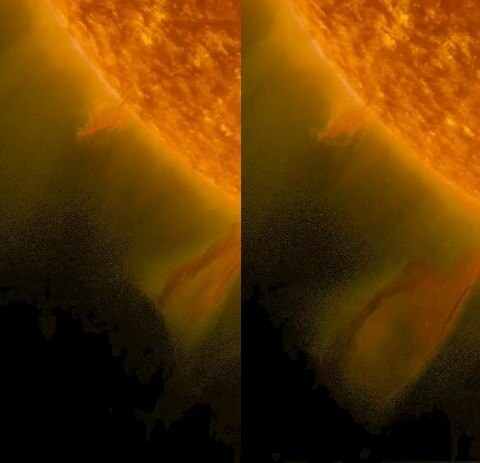 Here's a nice video of a similarly positioned prominence a year earlier (from STEREO-A, so the other side) , where you can see the 3D nature of it more clearly. Watch the large movie linked above, and you can see that it's a huge arching band, that would look similar when viewed from the other side. If there was an accompanying cavity, then that would also look similar. The significance comes from C. Alex Young's response to the event. When you look at it from another perspective as seen by stereo b you are no longer "looking down the tunnel". An illusion should only be viewed from one perspective. When viewed from two different angles, and you still have a sphere....well you still have a sphere. No conspiracy here, but the explanation is becoming more confusing. We are viewing a convincing sphere shape from multiple angles. How cool is that? Yes you are, you are just looking down it from the other side. 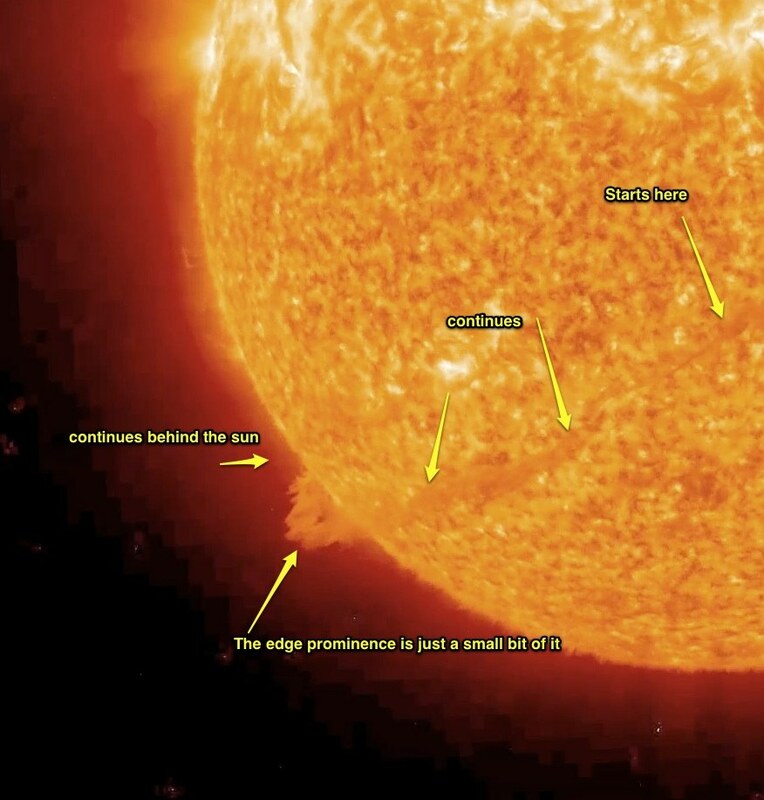 See the huge band going around the sun. Now imagine a tubular void above that ("above" meaning further out from the sun, not above in the image), also continuing around the sun. At the prominence you'd be looking one way down the dark tube, and from the other side, you'd be looking the other way. You'd see the same thing. Here's another blog giving some good info on the phenomena, including photos and comments about previous occasions it has been seen. He's describing looking down the "tunnel" of a tubular structure but what you actually see in two dimensional pictures is a cross section of that tube thus you wind up seeing what appears to be a spherical object. His wording was a little awkward but it makes perfect sense when taken within the overall context and other details, unless one just cherry picks those three sentences and ignroes the rest. What shape is the cross section of a cylinder? What shape do you actually see when looking down the end of a straw? A spherical shape. 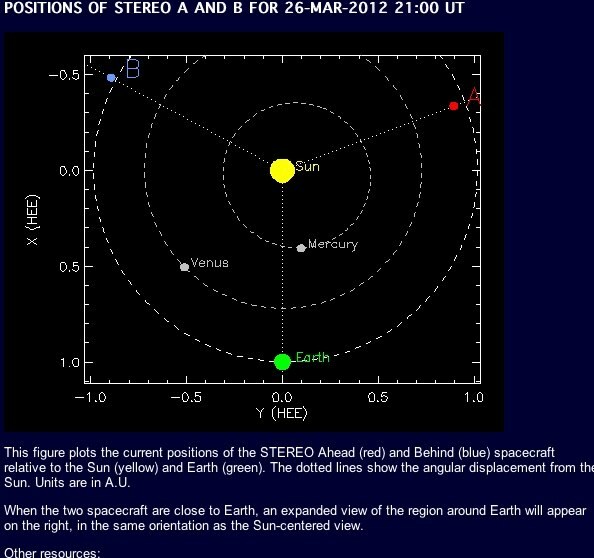 Look closely at the orbit diagram, and the locations of STEREO A & B. With the middle of the sun as the center point of a circle, the angle between the STEREO spacecraft and Earth is ~135o. Look at the location of the prominence/cavity in STEREO B images and the location of the prominence/cavity in the images from SDO orbiting Earth. That would put that spot on the sun centered circle at around a 67.5o angle between both STEREO B and Earth, half of 135. STEREO B is looking "down the tunnel" of the same tubular structure but from the opposite side. The prominence/cavity are not near the center line of the solar disc in STEREO B images, it's in the lower right corner along the limb. In SDO images it's in the lower left corner. 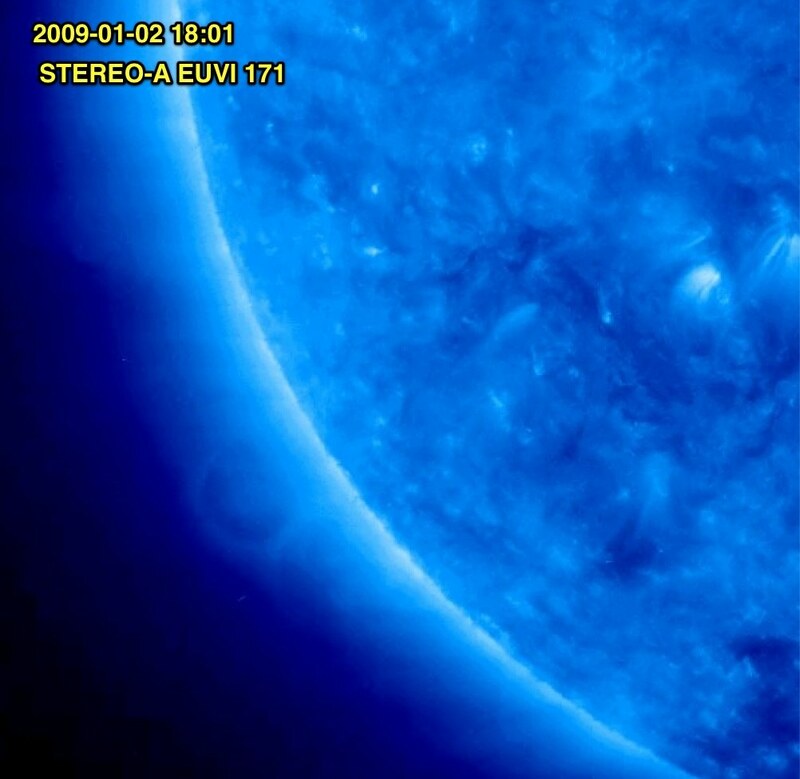 STEREO B's perspective provides a "mirror image" to SDO's perspective. This one just fades away though, no CME. It actually looks a bit like two cavities, with a less well defined one below and to the right of the more obvious one. Again though it's kind of an illusion, as it's 3D structure. Couple of animated Gifs I just made. The second one is the event of interest. The first one is an earlier CME. How do you explain the static nature of this "object"? The sun appears to be rotating while this object seems to be static. See the above posts. It's like a tunnel. Hasn't anyone told these people that a spaceship that size would be many times larger than the earth! I bet they'll tell is it's the force field that is that size, from some unknown force physicists haven't discovered yet (as if that isn't derived from modern fiction). Whatever. Thanks. 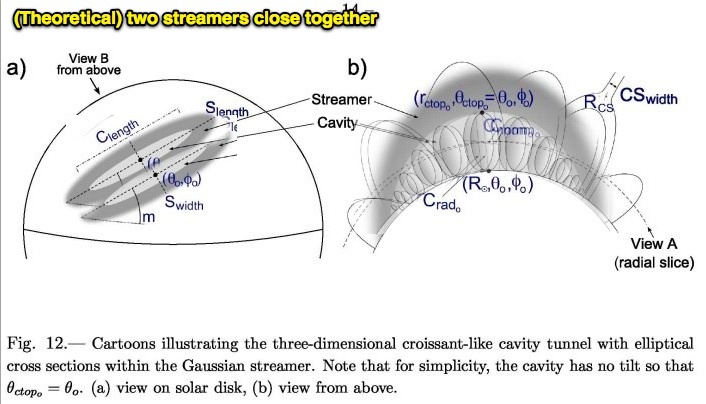 What is the geometric explanation for two very close ("contacting") spherical cavities? Can you link to this? I'm not sure what you are referring to. Beats me. What the's original source image like? It could be that A and B are not the same distance from the camera. Like the picture posted. But IF A and B were close, do you know of any geometric models explaining such a phenomenon? In my opinion your answer (in #17) would not. By the way, the Giant Black Sphere reported was about 340 times the size of Earth (volume), which pretty much excludes any kind of vehicles! I'm not sure this would happen though, for physics reasons. But then I've not seen a photo yet. Mick in your close up .gif of the "object" shooting away if it was an actual "ship" of some kind it appears to be pushing away all the space around it like a "Dark-matter force-field" of some sort and sucking up some energy off the Sun like a straw. One thing that always catches my eye is the energy wave that's seen when the "object" pushes away rapidly from the surface. The same wave is seen when your foot lands each time while running on a dusty road. A cloud of dust pushes way from underneath your shoe and on the release of your foot lifting up off the ground quickly the stird up dust gets sucked back in around it from the center and tries to follow your shoe making a spiral pattern. SO, somewhere in there what we cannot see is what pushes it way so fast with so much force and not hurting the Sun. What we do see though is the trails following the object away and the ripple on the surface as if it had been touched. So after all of these examples, all of these theories... is it safe to say that this is a natural occurrence with the Sun, or is it, by any means, some form of re-fueling if you will, by a spacecraft of any kind? Is it anything to be concerned about? I think it's pretty safe to say this is just a normal thing that the sun does occasionally. It's obviously not a spaceship, but that doesn't rule out the possibility of a spaceship being that size. Given the size and unpredictability of the universe, it is plausible that a vehicle could be that size, if not bigger. That would require some new physics, but sure, anything is possible. PS: I understand your work on this website but to ridicule people's oppinion is never a good way to find the truth. Mr. West: Here's another close-up video where it's possible to observe the phenomena. A simple question I have for you now: Don't you think that is too much coincidence that whenever it happens (2012/03/11 and 2012/05/25) your so-called "barrel" is always pointing to the camera? PS: Greeting from Brazil ! No, because that's the only time you'd be able to see it clearly. but to ridicule people's oppinion is never a good way to find the truth. "Not a giant space ship sucking fuel from the sun." A - Why, if this phenomena is being produced by the sun, it comes into existence distant from it only to be connected with a "vortex" after sometime ? B - Why, if this phenomena is being produced by the sun, it remains in stationary orbit (as you can notice the slow rotation of the sun takes almost 24 earth hours) ? You do know that that is what was being suggested it was? He didn't make that up. So to say what it's not is ridicule? Accepting that as the general suggestion of all minds is not going to make any of you brighter or smarter. Only because there are idiots in the Universe it does not make the rest of us Solar Scientists. Still there is a mistery to be solved. Accepting whatever the media says is the way to stupidity. But if you want to play that role, it's your choice. I'm still interested in the phenomena, whatever it is, and it's far from solved.